One of the most mysterious stellar objects may be revealing some of its secrets at last. Called KIC 8462852, also known as Boyajian's Star, or Tabby's Star, the object has experienced unusual dips in brightness—NASA's Kepler space telescope even observed dimming of up to 20 percent over a matter of days. In addition, the star has had much subtler but longer-term enigmatic dimming trends, with one continuing today. None of this behavior is expected for normal stars slightly more massive than the Sun. Speculations have included the idea that the star swallowed a planet that it is unstable, and a more imaginative theory involves a giant contraption or "megastructure" built by an advanced civilization, which could be harvesting energy from the star and causing its brightness to decrease. A new study using NASA's Spitzer and Swift missions, as well as the Belgian AstroLAB IRIS observatory, suggests that the cause of the dimming over long periods is likely an uneven dust cloud moving around the star. This flies in the face of the "alien megastructure" idea and the other more exotic speculations. The smoking gun: Researchers found less dimming in the infrared light from the star than in its ultraviolet light. Any object larger than dust particles would dim all wavelengths of light equally when passing in front of Tabby's Star. "This pretty much rules out the alien megastructure theory, as that could not explain the wavelength-dependent dimming," said Huan Meng, at the University of Arizona, Tucson, who is lead author of the new study published in The Astrophysical Journal. "We suspect, instead, there is a cloud of dust orbiting the star with a roughly 700-day orbital period." We experience the uniform dimming of light often in everyday life: If you go to the beach on a bright, sunny day and sit under an umbrella, the umbrella reduces the amount of sunlight hitting your eyes in all wavelengths. But if you wait for the sunset, the sun looks red because the blue and ultraviolet light is scattered away by tiny particles.The new study suggests the objects causing the long-period dimming of Tabby's Star can be no more than a few micrometers in diameter (about one ten-thousandth of an inch). From January to December 2016, the researchers observed Tabby's Star in ultraviolet using Swift, and in infrared using Spitzer. Supplementing the space telescopes, researchers also observed the star in visible light during the same period using AstroLAB IRIS, a public observatory with a 27-inch-wide (68 centimeter) reflecting telescope located near the Belgian village of Zillebeke. Based on the strong ultraviolet dip, the researchers determined the blocking particles must be bigger than interstellar dust, small grains that could be located anywhere between Earth and the star. Such small particles could not remain in orbit around the star because pressure from its starlight would drive them farther into space. Dust that orbits a star, called circumstellar dust, is not so small it would fly away, but also not big enough to uniformly block light in all wavelengths. This is currently considered the best explanation, although others are possible. Citizen scientists have had an integral part in exploring Tabby's Star since its discovery. Light from this object was first identified as "bizarre" and "interesting" by participants in the Planet Hunters project, which allows anyone to search for planets in the Kepler data. That led to a 2016 study formally introducing the object, which is nicknamed for Tabetha Boyajian, now at Louisiana State University, Baton Rouge, who was the lead author of the original paper and is a co-author of the new study. The recent work on long-period dimming involves amateur astronomers who provide technical and software support to AstroLAB. Several AstroLAB team members who volunteer at the observatory have no formal astronomy education. Franky Dubois, who operated the telescope during the Tabby's Star observations, was the foreman at a seat belt factory until his retirement. Ludwig Logie, who helps with technical issues on the telescope, is a security coordinator in the construction industry. Steve Rau, who processes observations of star brightness, is a trainer at a Belgian railway company. Siegfried Vanaverbeke, an AstroLAB volunteer who holds a Ph.D. in physics, became interested in Tabby's Star after reading the 2016 study, and persuaded Dubois, Logie and Rau to use Astrolab to observe it. "I said to my colleagues: 'This would be an interesting object to follow,'" Vanaverbeke recalled. "We decided to join in." 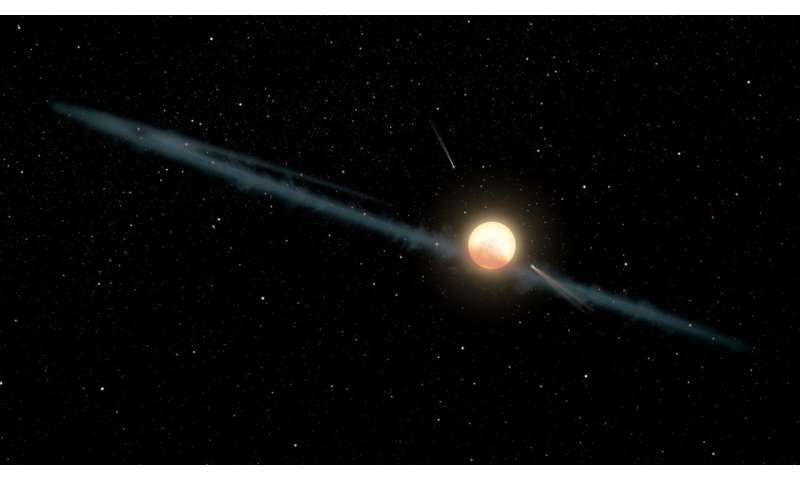 University of Arizona astronomer George Rieke, a co-author on the new study, contacted the AstroLAB group when he saw their data on Tabby's Star posted in a public astronomy archive. The U.S. and Belgium groups teamed up to combine and analyze their results. While study authors have a good idea why Tabby's Star dims on a long-term basis, they did not address the shorter-term dimming events that happened in three-day spurts in 2017. They also did not confront the mystery of the major 20-percent dips in brightness that Kepler observed while studying the Cygnus field of its primary mission. Previous research with Spitzer and NASA's Wide-field Infrared Survey Explorer suggested a swarm of comets may be to blame for the short-period dimming. Comets are also one of the most common sources of dust that orbits stars, and so could also be related to the long-period dimming studied by Meng and colleagues. Now that Kepler is exploring other patches of sky in its current mission, called K2, it can no longer follow up on Tabby's Star, but future telescopes may help unveil more secrets of this mysterious object. "Tabby's Star could have something like a solar activity cycle. This is something that needs further investigation and will continue to interest scientists for many years to come," Vanaverbeke said. Finally, an explanation for the "alien megastructure?" Is the "alien megastructure" around Tabby's Star actually a ringed gas giant?